1:55 Time I hopped off to bed. Strangely white outside. There is a white frostiness on the grass and it's topped off with a white fog. At least it's not gray! everybody! Rats, wide awake at 2.30am again. Silly wallaby, I don't need a sign to be caught standing wondering which way to go. I'm taking a break from doing some cleaning. Well, de-cluttering, really. If I'm going to use the dining room table for Thanksgiving, it would be good to be able to see it. The way our house is set up, the first flat surface you come to from the front door is the table, or, ''dumping ground'' as we sometimes refer to it. Oh golly, I have the same problem, Kathy~ First flat surface is my dining room table, too, and it has collected somethings that need to disappear before Thanksgiving here! Can't you just hollow out little pockets just big enough for a plate, all around the table? Lanky Yank for the cute photo of a Wallaby[I think it's a Wallaby]. 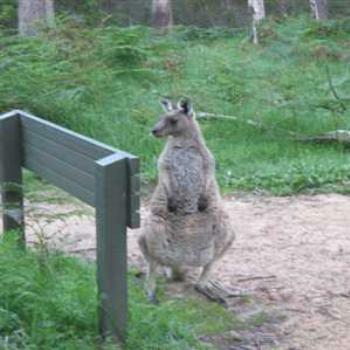 Morning all, hope the Wallaby checks for traffic before they go hopping. Kathy, it's the same here even our visitors put their handbags one our table. I like Keith's suggestion! Hilarious! Is Keith planning to have a mad wombat's tea party? Invite me, invite me! Everybody!! Ultra late today. Too many errands, etc. Yep, smoke still here. Oops! I tripped over Keith's twenty two. Peter - You crack me up! G'day everyone, it is time to reveal the answers for last Saturday's 3&4 puzzle. There have been 8 responses and judging by how many people have got 100% right it can't have been too hard or maybe it is that everyone is so brilliant.